Currently there are over 165,000 health applications (“apps” or “trackers”) available for smart devices. Health tracker sales have exploded by 330 percent in the past three years. This booming market offers apps for fitness, nutrition, meditation, sleep, fertility, emotional wellness and more. Whatever your goals, investing in a health tracker that best suits you may help you boost the profits of the most valuable asset you have: long-term health and wellness. Health apps and trackers encourage healthy lifestyles by allowing users to log daily information about overall health, nutrition and activity. They may paint a brighter, clearer picture of one’s health and daily habits. Some popular health apps, like MyFitnessPal and Calorie Counter by FatSecret, allow users to log daily food intake, providing the exact nutrient content and adjusting it with caloric expenditure. Health apps may also reveal and bridge gaps between daily behaviors and health goals. They teach users to set and manage goals on a daily basis, making them much more likely to achieve them. Some apps will motivate users with rewards, reinforcements and status upgrades when they achieve healthy goals. Health trackers are also highly convenient. Users have an easily accessible and portable e-coach to help log and track minute-to-minute health data and alert them with reminders on healthy behaviors. If users need inspiration on healthy activities, apps provide them with a portable, never-ending library! They can also generate social well-being and accountability through opportunities to form games and competitions with other users. Although some health devices may be considered pricy, many can be used for as little as $7 to even 99 cents, but the majority of them are free. A few dollars spent on a useful health tracker is small in comparison to the priceless, healthy life it may help you achieve. Health trackers are not a magic pill. They have some subtle disadvantages. The “10,000 steps per day” program was initiated in Japan by calculating the exercise it takes for men who burn 2,000 calories a day to maintain health. Ten thousand steps were then appointed as the universal daily minimum for healthy activity levels. Not everyone, however, may need or be able to achieve this. Health is not “one-size-fits-all.” If a pregnant woman, someone with obesity or someone who has arthritis attempts to perform a workout designed by a fitness app, there may be risk of injury. Similarly, users should practice caution in trusting nutrition app guidelines for calorie and nutrient intake. It is always wise to check with a primary physician or other health professional to ensure it is safe for you to begin a new health or fitness program. Another disadvantage is inaccuracy. Often the heart rate goes undetected during physical activities, or food logs contain inaccurate nutritional information. Although it is helpful to know calorie intake and expenditure, also be aware that most users treat this data as an excuse to “reward” oneself with unhealthy behaviors such as binge eating or consuming unhealthy foods to achieve calorie goals. A recently surfacing and final concern is privacy. Many apps, particularly the free ones, will contain inconspicuous fine print explaining that users’ personal data may be public or sold to third parties. Reading all the fine print beforehand may alleviate potential problems for user privacy. If you are overwhelmed with the choices, Wellocracy (wellocracy.com) is a useful online resource that provides a quiz to help you choose the health trackers best suited for you! Young people can benefit from apps that involve exercising to win games through stories and simulations. Those who work in office settings may benefit from apps that send reminders to move, drink water or stretch regularly. Seniors can benefit from using health trackers for physical activity and brain activity. Apps with puzzles and games stimulate memory and cognition, which may improve symptoms of cognitive decline. 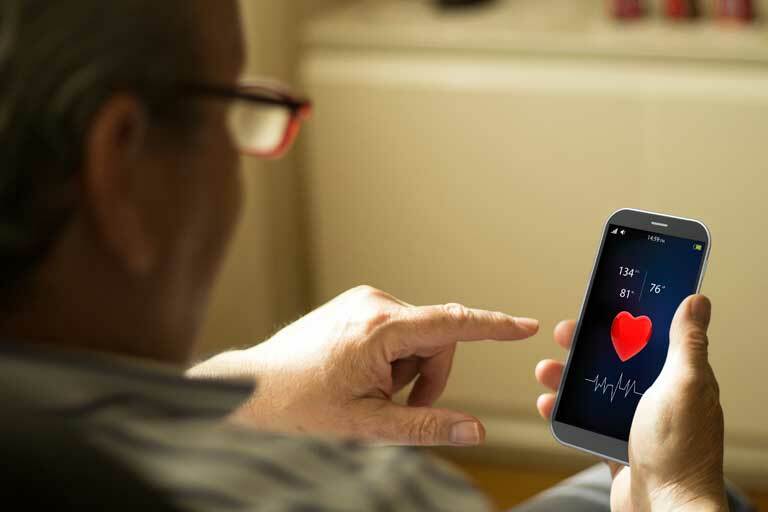 Moreover, seniors can benefit from apps by logging daily heart rate, blood pressure and medications, and taking the accrued information to their doctors. All things considered, an app that helps users log health data is not always enough to create positive outcomes. Most health apps lack behavioral science features like coaching and motivational incentives that promote permanent lifestyle changes. The core is intrinsic motivation – whatever the goal, the user has to truly want and believe it. Some people may lack the intrinsic motivation needed to reach or maintain healthy behaviors. In this case, the extra push from health trackers may be beneficial. The key is not relying solely on the device. It is your job to sustain the healthy behaviors after the device is turned off or out of sight. Learn to develop the power of intrinsic motivation, and you will be unstoppable. Health trackers provide general awareness, promote mindfulness and give a library of resources to aid the user in forming healthy behaviors. But remember: you don’t work for the tracker. It works for you! Health trackers are just tools. You, the user, are the catalyst.